Posted May 24, 2018 by Staff Writer & filed under Arts & Entertainment, Movies. There seems to be a trend for period dramas in British film making of late, and here’s another. The Bookshop is set in recent history (1959) in a country village with the usual hotchpotch of characters. 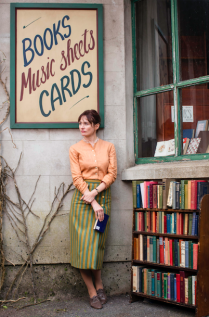 It’s an adaptation of the novel by Penelope Fitzgerald and tells the story of Florence Green (Emily Mortimer), a young widow who purchases an abandoned old house and converts it into a bookshop, much to the chagrin of wealthy, unlikeable Violet Gamart (Patricia Clarkson). Mrs Gamart, a social climber and political influencer had been planning for the old house to become an arts centre, and she wasn’t about to let an audacious outsider get in her way. Florence finds allies in the precocious young red head, Christine (Honor Kneafsey) who helps out in the shop; and the reclusive book lover, Edmund Brundish (Bill Nighy) who is already a sworn enemy of Mrs Gamart. This is a sweet film, perhaps a little light on plot peaks and troughs, but full of lovely scenery, good dialogue and un-gushy sentiment.